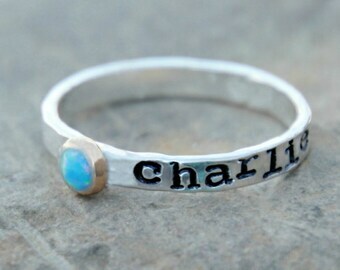 Please let me know the name(s) you would like stamped on your ring(s). I cut, hammer, stamp, shape, solder, and sand each ring by hand in my studio using thick .999 Fine Sterling Silver, 14K Yellow Gold-Filled, or 14K Pink (rose) Gold-Filled, so each ring has a beautiful, organic look to them! A lot of time, care, and attention goes into each ring, which customers can see when they receive them. You can read some of their reviews in my shop. 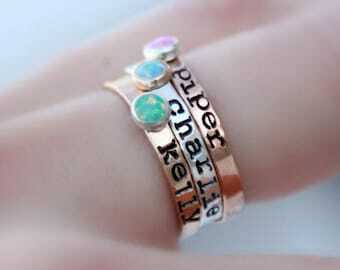 ★Each band is 2.5mm - 3mm wide. ***FOR ORDERING MULTIPLE RINGS***: Make your selections in the drop down boxes, click the 'add to cart' button, then return back to the listing to make your next selection. Once you have the desired amount of rings in your cart, proceed to checkout where you can let me know all your stamping info in the 'notes to seller' box. Etsy will automatically combine your shipping! ★You can have any name/date/or special word you like. ★PLEASE SEE 4th PHOTO FOR FONTS. IF A FONT IS NOT CHOSEN I WILL USE TYPEWRITER FONT. ~~~You can choose to have the letters left PLAIN or have them DARKENED in. Please see all photos. If not stated, I will darken them. ***NOTE ABOUT ALL ROSE GOLD RINGS: Rose gold solder contains cadmium, a very toxic heavy metal, so I use solid 14K yellow gold solder to join the rings together, which can sometimes leave a very tiny spot of solid yellow gold on the underside of the ring, which is not visible when the ring is worn. This lighter spot should not be considered a flaw, this is part of its natural organic beauty, and a sign of it truly being a handmade ring. ~~~Please read: hand-stamping is not an exact science, each letter is hammered into the metal one at a time by me, not engraved. I always do my best to make sure each letter is properly aligned and on the ring, however it is almost impossible to get all of them lined up and centered perfectly and exactly the same, which adds to the hand made charm. 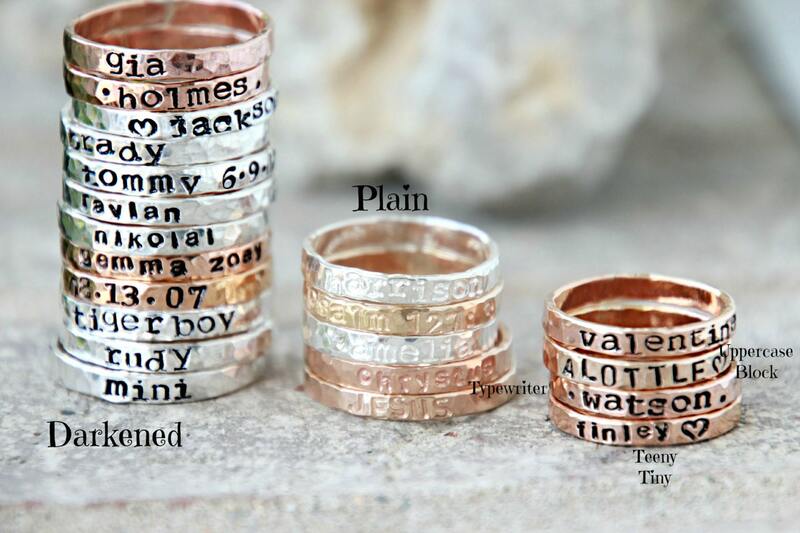 Each ring will be beautiful, organic, and one-of-a-kind! Thanks so much for the ring and from my previous order (I could not review it for some reason). This turned out great. Exactly what I was looking for and communication and shipping was spot on. 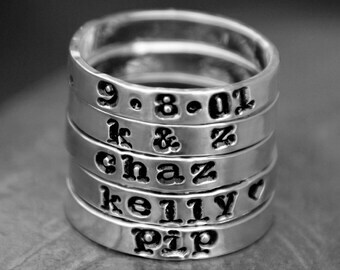 Love my rings! (not my dry winter hands tho lol) I chose a fun font and all 3 band colors. They fit perfectly, size was right on. Shipping was quick. Thank you! Love, love love! 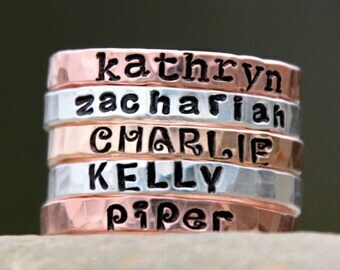 The rings are absolutely beautiful.